About this object A 19-term Member of Congress from Florida, Dante Fascell chaired the Committee on Foreign Affairs for five terms. On this date, the House of Representatives unveiled a portrait of Foreign Affairs Committee Chairman Dante Fascell of Florida. Considered a leader on Latin American and Caribbean Basin policy, Fascell chaired four Foreign Affairs subcommittees, including one after the committee's name was briefly changed to International Relations. Chairman Fascell took up the gavel for the full Foreign Affairs Committee from 1984 to 1992. Chairman Fascell’s portrait was unveiled in the Foreign Affairs hearing room, with fanfare and accolades from the House’s leadership. Secretary of State George P. Schultz also attended the ceremony. It was the fifth and final portrait painted for the House by artist Robert Bruce Williams, who previously painted William Dawson of Illinois, Ray Roberts of Texas, and William Jennings Byran Dorn of South Carolina. Williams placed Fascell against a colorful abstract background that is echoed in the sitter’s tie. The light behind Fascell becomes brighter in the top third of the painting, bringing the viewer’s attention to the chairman’s face. He perches on a stool, with his body twisted slightly in contrapposto, a pose that harks back to ancient Greek sculpture, and gives the portrait a sense of movement, as if the chairman were about to stand. 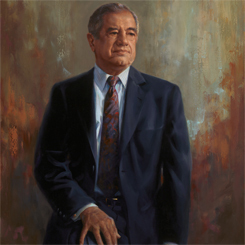 Fascell served in the House for 38 years, 36 of which he was also a member of the Foreign Affairs Committee. Reflecting the interests of his greater Miami district, he was a vigorous opponent of President Fidel Castro of Cuba and a firm supporter of Israel. A proponent of bipartisanship in foreign policy, he supported President George H.W. Bush’s decision to commit American forces in the first Gulf War in 1991. For more than a century, the House of Representatives has collected portraits of the men and women who lead its committees. These images, a number of them produced by major American artists, provide a vital visual record of House history.